CD review: "Cigar Music: Tobacco Songs From Old Havana"
This review first appeared in the September 6, 1996 issue of the North County Times. Really, in these politically correct times, do we need a collection of music extolling the virtues of the leaf? Given the quality of the music found on this new collection, both those who love a fine montecristo after dinner with a little cognac and those who eschew life's epicurean and smoking pleasures ought to be able to enjoy it. 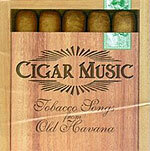 "Cigar Music" is based on the tradition of Cuban cigar factories providing live music for their workers. The music here is a combination of songs about tobacco and traditional works that would have been heard in the factories. Another neat element of this collection is the presence of two singers from the Cuarteto Tiempo  while most Cuban cuartetos have only male singers, Coralia Arregoitia Cruz and Roxana Prado Figueroa bring gorgeous vocal harmonies to the music.